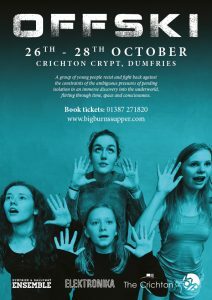 Zoë choreographed and directed movement on this exciting debut youth project for Dumfries and Galloway’s Youth Ensemble earlier in 2018. The work was performed in a breathtaking venue in The Crichton Estate, Dumfries and gave young budding performers the chance to learn from industry professionals and test out their own devising skills. Supported by Elektronica and Year of Young People, Scotland, the project offered a dark and innovative immersive look into political resistance and human behaviour. A mature theme for a young cast made up of tomorrow’s performers.